A rip in your tire can leave you stranded. Always carry a boot. The brown cord at the tear is the boot. It’s the second time in a year that a boot came in handy. Riding down Stage Road on Sunday my rear tire flatted. The loud pop indicated a blowout. Even though I was going fast, rear flats aren’t so bad. Front blowouts are a different matter. I stopped and began the usual routine of replacing the tube. I didn’t look for the cause of the flat, which was my big mistake. Locate the hole and make sure you know the cause. I ran my fingers over the inside of the tire, but that was it. After the quick change I set off again, only to have another rear blowout seconds later! I then had to patch the tube and noticed this time that it was a large cut at the bottom facing the rim. However, I saw nothing wrong with the rim, so I patched the tube and set about once again inflating the tire. This time I heard a hissing sound even before the tire was fully inflated. I looked at the tire and immediately saw the problem. The tire had separated near the wire bead and the tube was oozing out. Once again I had to patch, choosing the other tube, which had smaller slice, but this time I had the solution, which I always carry – a boot. 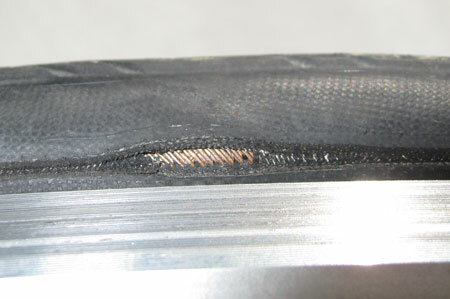 The piece of bike tire went between the tube and the tire, covering the hole. I filled the tire with air and was on my way. At the summit of Skyline Boulevard I decided to check the tire just to be sure all was OK. You don’t want a blowout descending Page Mill Road. Sure enough, the tube was bulging again. I let the air out and repositioned the boot to cover the hole. The descent on Page Mill Road went without incident and I made it home. Next I’ll review the tire and give my observations about tires. This entry was posted on May 28, 2012 at 8:19 am and is filed under Repair. You can follow any responses to this entry through the RSS 2.0 feed. You can leave a response, or trackback from your own site.